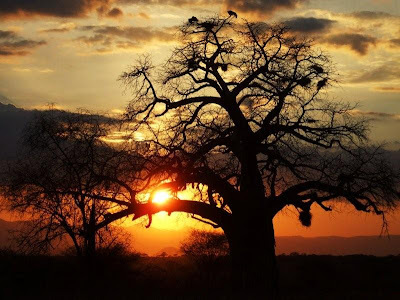 Safari Ecology: How old is a baobab? I was lucky enough to see the New Year in, at Tarangire NP where, as always, I was impressed by the immensity of baobabs Adansonia digitata. 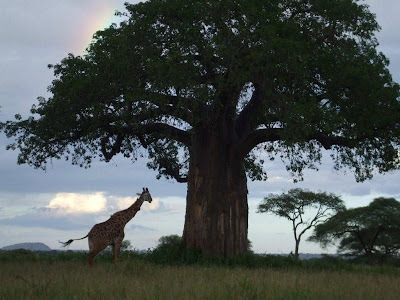 When you see elephants dwarfed by a tree, you know it's impressive, and Tarangire is the place to spot both elephants and baobabs. But the two questions I'm often asked about baobabs are firstly, how old are they? And then, why don't we see baby baobabs? As they're perhaps both related issues, and because I found a nice paper that explains how we determine the age of baobabs (available, but not free I'm afraid, here), I thought it would make a nice post. The age of many trees is easy to estimate by simply counting annual rings: in temperate climates growth happens during the summer period, and slows during the winter, depositing a dark ring each year. In the tropics many trees have growth rings formed during the dry season. The problem with baobabs is that they have a succulent trunk that (a) gets stripped by elephants for water, (b) doesn't really have clear growth rings and (c) is often hollow. So a standard method of counting rings won't tell us how old the tree is. Instead we have to turn to radiocarbon dating. This is a method commonly used to age archaeological remains and replies on the fact that when a plant grows to 'fixes' CO2 from the atmosphere in its woody matter. Now, the carbon (C) in the CO2 of the atmosphere occurs in two forms which we call 14C and 12C. Now 14C is radioactive and changes ('decays') at a constant rate to Nitrogen, whilst 12C is stable. So if we compare the proportion of 14C and 12C in a sample with the proportion present in the atmosphere, we can calculate how much 14C has decayed, and therefore how old our sample is. 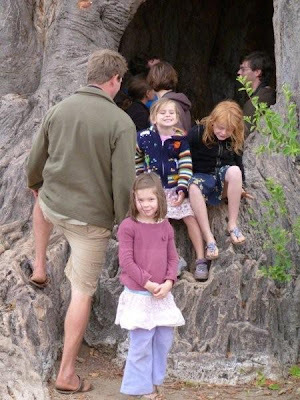 So what Patrut and others have done, is to take samples of wood from with the hollow cavities within one particularly large baobab, and use radiocarbon dating methods to estimate the age of the tree. And they find some interesting results even for this one tree - the tree in question has two stems, one much larger than the other. We might suspect that the larger stem is, of course, the older one. But this isn't the case at all - the smaller trunk is estimated to be over 1060 years old, whilst the much fatter trunk is around 300 years newer. So once the tree is already pretty big, the size of the trunk is no useful guide to the age of the tree - and the authors also note several other similar studies they've done of other trees which confirm this pattern. They suggest that what matters is the initial conditions over the first 100 years of a stem's life - if it's particularly favourable the stem grows very quickly, and then keeps growing quickly for the rest of it's life (early life conditions are often very important for later growth rates in a range of organisms). 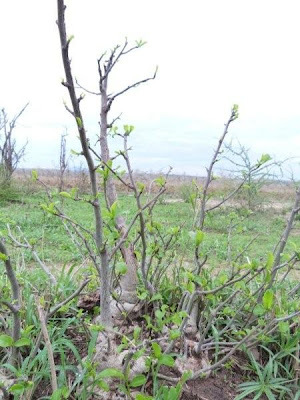 So if a stem starts in a particular good time, its growth can easily overtake older trees who struggled to grow fast early on in life, so the biggest trees aren't necessarily the oldest. None the less, from this and other studies of baobabs it's still clear that very large baobabs are often over 1000 years old - the oldest known was over 1275 years old when it died. Glad you think so, and welcome to the blog! This is great! I traveled to Madagascar a couple of years ago and fell in love with the baobabs, came away with all kinds of questions about them. I did actually see quite a few baby baobabs, but I think they had been planted by people in the place we were staying (Blue Ventures HQ, Andavadoaka). Sadly, I'll probably not be around in 1000 years to see! Would love to see some of those Madagascar species though... Let along the birds and mammals... One day! Oh this is interesting! I lived in Malawi for two years, right next door to a magnificent baobab tree, I've always found them fascinating! Interesting and lucid--enjoyed my visit! Why are female raptors usually bigger than males? What is the savanna biome?